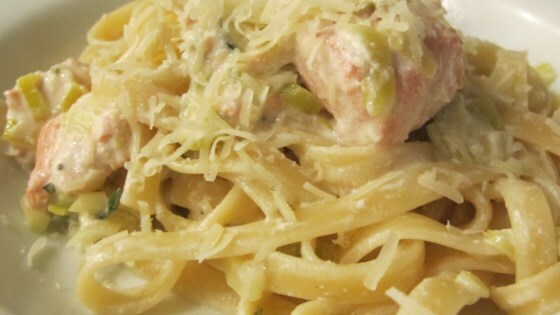 "A cheesy, creamy and indulgent salmon and leek pasta dish that is ready in under 30 minutes. Perfect with a glass of chilled white wine and a soft baguette for mopping up the sauce." While spaghetti is cooking, melt butter in a large skillet over medium heat. Cook and stir leek until soft, about 5 minutes. Pour in white wine and simmer until almost all the wine has evaporated, 3 to 5 minutes. Stir in sour cream and 1 ladleful of spaghetti cooking water and mix well. Reduce heat to low. Add salmon and cook until it is cooked through, about 5 minutes. Season with salt and pepper. Stir in savory and thyme. Drain spaghetti and toss with the creamy salmon. Serve sprinkled with Parmesan cheese. Savory is an herb similar to thyme but not as strong in flavor. It may not be available in your local supermarket, so try looking online or in specialty shops. In a pinch, you can omit it.